Greetings from the Sunshine State! Georgio and Kristan are a fun, loving, compassionate, and outgoing couple who love adventure. They’re excited and ready to expand their family through adoption, and are open to letters, pictures, and visits with you! They’ve made a cute video to introduce themselves and share more about what they have to offer your child. Keep scrolling to learn more about this loving and outgoing Florida couple! Bi-racial Couple in the Sunshine State Hope to Grow Their Family Through Adoption from Lifetime Adoption on Vimeo. You can find out more about hopeful adoptive couple Georgio and Kristan by visiting their adoption website. You may also view all adoptive family profiles here on AdoptionAgencyFlorida.com. If you see an adoptive family that you’re interested in, please give us a call at 1-877-383-6847. Loving & Adventurous Adoptive Couple from Florida on Video! Justin and Christina are an adoptive couple from Florida who are praying that their family can become a blessing to yours. They’re a loving, hard-working, and adventuresome couple who want nothing more than to welcome a new child into their lives. Justin and Christina offer a stable home and solid marriage. Florida Adoptive Couple Justin and Christina's Adoption Video from Lifetime Adoption on Vimeo. You can find out more about hopeful adoptive couple Justin and Christina by visiting their adoption website. You may also view all adoptive family profiles here on AdoptionAgencyFlorida.com. If you see an adoptive family that you’re interested in, please give us a call at 1-877-383-6847. Chris and Diana are an artistic, active, creative, stable loving family living in the Sunshine State, Florida. This Florida adoptive couple have seen first-hand the blessings of adoption as Chris’ mom is adopted and they have a niece and nephew who are both adopted. Chris and Diana believe it’s a huge privilege to be adoptive parents and accept their responsibilities to you and your child with the utmost respect and commitment. They promise your child will be treasured and valued every day for the unique individual that they are. They’ve been married for 17 years and enjoy going tubing, swimming in their pool, jumping on the trampoline and traveling. They have property in West Virginia, where they like to ride 4 wheelers, explore that part of the country, and take cruises to Mexico to swim with the dolphins. Their son, Cade, is sweet, shy, and determined. “He will be an amazing big brother and is so excited about the possibility. He would be protective, loving, helpful and a positive role model,” Chris and Diana share. You can find out more about hopeful adoptive couple Chris and Diana by visiting their adoption website. You may also view all adoptive family profiles here on AdoptionAgencyFlorida.com. If you see an adoptive family that you’re interested in, please give us a call at 1-877-383-6847. 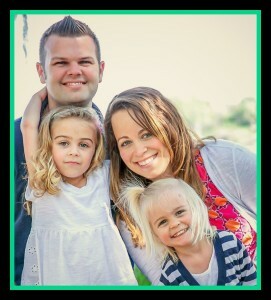 Corey and Amy are a Florida adoptive family who have two daughters, Camryn and Ella. They are looking forward to growing their family through adoption and their girls can’t wait to be big sisters! They love spending time all together, traveling, going to the beach, swimming and staying active. Corey works in sales and Amy’s a full-time stay-at-home mom. Corey and Amy’s family have three dogs: two yellow labs, Ryleigh and Reid, and a chihuahua mix named Moo. Their home has three bedrooms and two and a half baths and is in a quiet, family friendly neighborhood. Their daughters share a bedroom and the extra bedroom is all set up as the nursery. Their neighborhood has a community pool and playground and oftentimes hosts events for kids. Corey and Amy live in a rural area, close to parks and beaches but only about 30 minutes from larger cities. You can find out more about hopeful adoptive couple Corey and Amy by visiting their adoption website. You may also view all adoptive family profiles here on AdoptionAgencyFlorida.com. If you see an adoptive family that you’re interested in, please give us a call at 1-877-383-6847.